Wrap yourself in wonderful words with these scarves featuring dictionary definitions of inspiring terms. 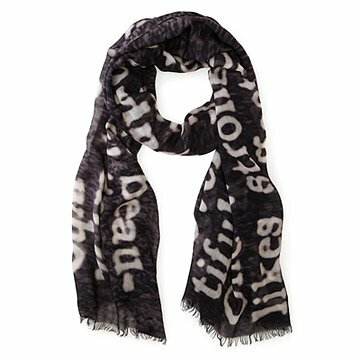 Wrap yourself in wonderful words with these scarves featuring dictionary definitions of inspiring terms. Vintage printing drawn from the pages of a classic dictionary celebrates the meaning of "Lovely" and "Radiant," on a soft modal scarf. The all-season accessory is a great gift for anyone with typographical taste. Made in India. Definitely Buy this if you're looking! Absolutely beautiful, designed in shape more like a shawl, but ideal for wrapping. Not square as pictured, more of a rectangular design. But makes it so much better, less bulky. Super soft, and very unique. A Birthday Present Done Well! I bought this as a birthday present to a dear friend, and I cannot do justice to her reaction to seeing it. The quality of the scarf is excellent - a bit lighter than I expected, but still very good for cool weather and hopefully will hold up well over time. Beautiful and elegant scarf that is a high quality garment. The scarf is a large piece of light, soft fabric with the word "radiance" and it's definition very clearly imprinted into the fabric. It is a wonderful garment that was truely admired by the recipient. Beautiful scarf! It was a perfect gift for my lovely daughter!